I like to be ready for any situation that may present itself out on the road. So, a tool kit that only has enough room for a credit card and a pair of mini Vise-grips isn't real popular with me. Admittedly, the tool kit that came stock with my BMW Cruiser is better than the one described above but still leaves a lot to be desired. I remember fondly the tool kits that I carried with my older BMWs and felt "that's the size of tool kit I want to carry with this bike!" The big problem here is room, a decent-sized tool kit can't possibly fit in the same space BMW provides for the stock tool kit. Sure, I could carry a few odds and ends in my coat pockets but that would mean finding a new place for the items there that I'd be displacing. Having procured a tool kit from a /6 BMW, I went about "adjusting" to make it more suitable for the Cruiser. Satisfied with my "mix and match" tool kit, I rolled it up and secured it with two large rubber bands. I convinced myself that this "new" tool kit was still about the size of a stock /6 BMW kit, more or less. Compared to the stock Cruiser tool kit, this thing is huge! Where on earth am I going to put it? Holding the tool kit out in my hand, I stood by my bike and pondered where to put it. Offering it here and there, I imagined it in some sort of container and lashed to the bike. 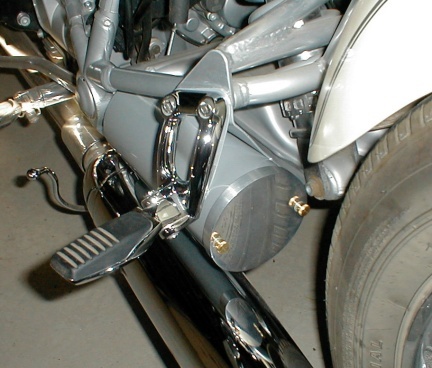 I had seen the results of hanging those silly leather tool pouches on the front forks (refinishing the forks and fender didn't sound real appealing), so that was out. While wandering about the garage and garden, I came across a short piece of metal tube that looked promising. 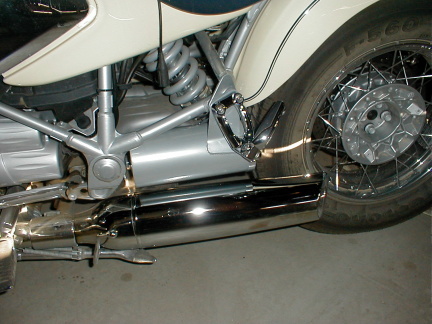 I found a couple of good spots to mount the tube but settled on the space above the muffler on the left side of the bike. This is the same space used for adjusting the rear shock. Looking back on the two times I've adjusted my rear shock, do I really need that space? I decided to go-ahead and use the space as it's been ten thousand miles since my last shock adjustment. The photos below reflect the results of my efforts. Tooltube, painted and in place. Tooltube shown from the rear. Two thumbscrews hold on the end cap. Now, I'm not quite sure where that tool kit went, but I'm confident I'll come across it!